I fell in love with this bride’s dress she designed and then had made by Monaco Couture – and the groom had a bowtie to match her stripes! Photographed by Erin Hearts Court and you can see the entire wedding here. 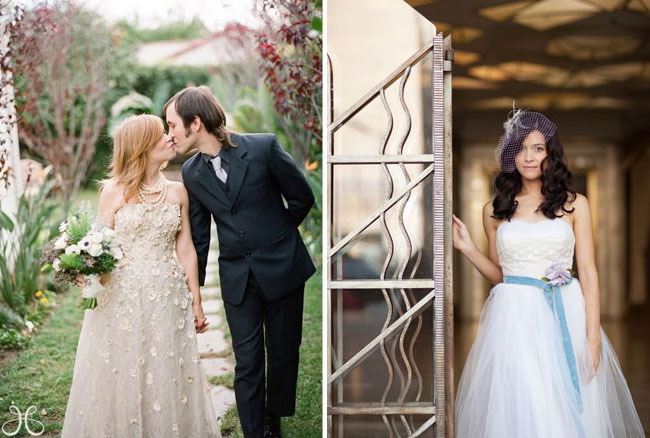 This sweet bride’s dress was made by her mom! So pretty and and love the chunky necklace the bride made too. Photographed by Jill Thomas, you can see the entire wedding here. As you may have guessed, I’m always a fan of fun gorgeous shoes. 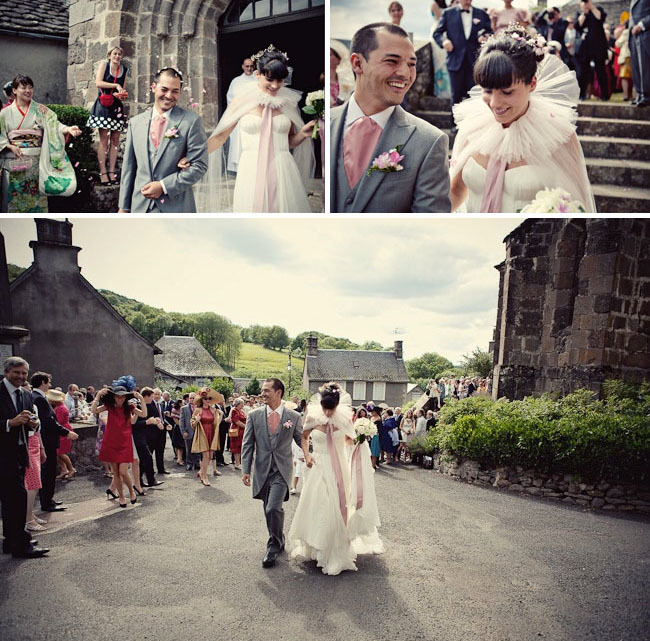 :) Love the Vivienne Westwood shoes from this wedding photographed by Leo Patrone. Grooms with socks to match their bride? Always a YES in my book! Photo on the right by Elizabeth Messina from this wedding. 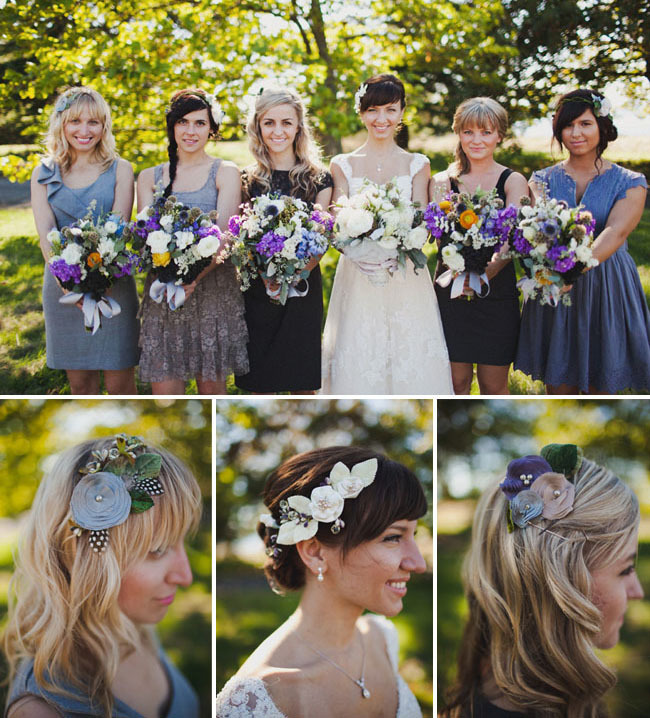 I think we all fell in love with the bridesmaids hair pieces the bride made from this adorable wedding photographed by Benj and Maddie Haisch. Cutest flower girls ever from this wedding photographed by Wildflowers Photography. 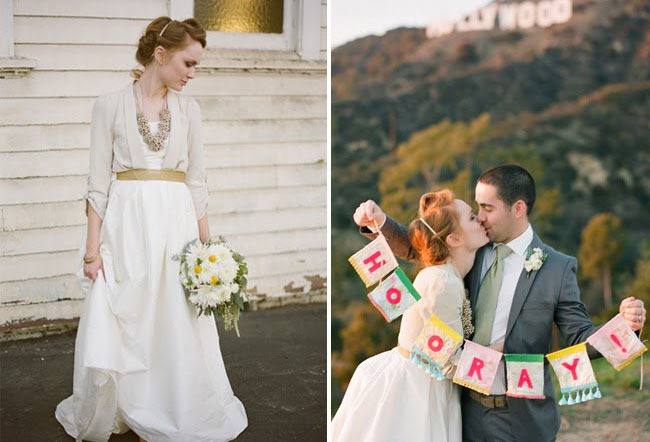 We saw some of the prettiest vintage wedding dresses! Adore this one on the left from Unique Vintage photographed by Jessica Claire. And this one from Mill Crest Vintage photographed by Sarah Yates for our 500 Days of Summer shoot was so pretty! And the glamourous dress by Temperley London we used for our Southern Wedding Shoot was TO DIE FOR. I still dream about that dress. :) Photographed by Stephanie Williams. 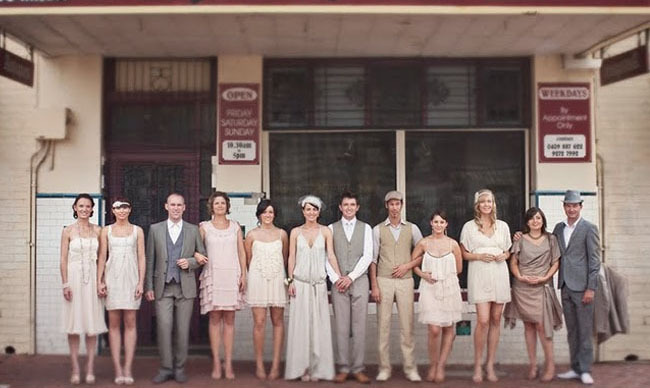 This bridal party was a perfect mix of vintage + modern from this wedding photographed by Paper + Lace Photography. We were lucky enough to share the wedding of one of our favorite fashion bloggers, The Cherry Blossom Girl. Her dress + veil were gorgeous as photographed by Marianne Taylor. And those gorgeous hairpieces! Love the top piece by Mignonne Handmade and that lovely couple from this shoot photographed by Sloan Photographers. The gorgeous bride (who is also a fashion designer) from the bottom photos MADE her wedding dress from the dress both her mother and grandmother wore and also made her headpiece. Photographed by Braedon Photography. Wedding Dresses with a Touch of Color! Pretty! I’m loving the “best of 2010” posts – you picked some good samples from throughout the year! The first dress is by far my favorite I’ve seen all year (or ever?). The hemline is so dreamy, and the stripes are so modern and funky – everything I like in a wedding! gack. loved all your picks! don’t know you pick them since you feature so many gorgeous weddings! 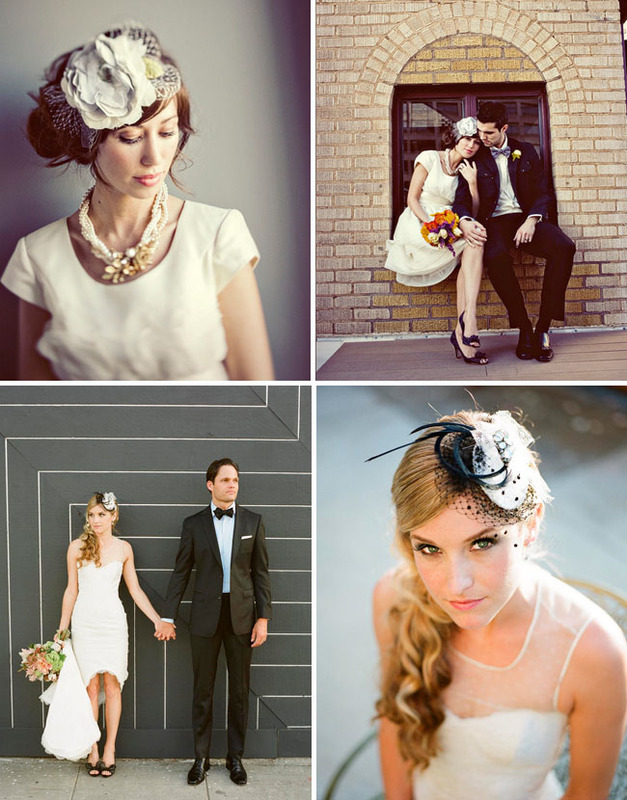 In my opinion, the last picture is absolute the most beautiful, its color and effect are perfect, and the vintage style dress is elegant, and the headwear suits the hairstyle perfectly, which makes the bride look gorgeous! Honored to have some photos in your favorites selection for the year!!! Means a ton! All your choices were excellent. Temperly London dress as well now. These are all so great. That Temperly London dress is killer! I love these dresses, especially the vintage and temperley London dresses. I just hope i can make my own as good as the fashion designer in the bottom pictures! And those hairpieces are absolutely gorgeous! !